You are currently browsing the tag archive for the ‘logging’ tag. Ghana. “At the turn of the 20th Century, Ghana’s forests covered around 8.2 million hectares of land. By the late 1980s, the forest cover has been reduced to less than 18,000 km2, which means a reduction of the forest cover to 2.1 million hectares. 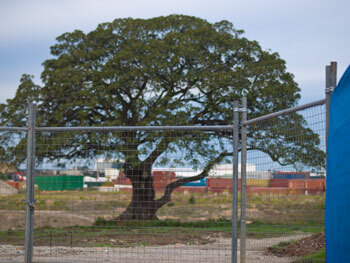 The 1535 hectare site is to be developed by Delfin Lend Lease to create a new suburb – Jordan Springs. It is one of the few green belts left in Western Sydney & is home to 110 bird species, 10 reptiles, 9 mammals, 8 frog species, 3 of them endangered & many plant species, including 4 rare ones. It is the last remaining habitat for around 50 Koalas. This may not seem many Koalas to require the stopping of logging a forest, but at The Australian Koala Foundation website, https://www.savethekoala.com/ they say, “there are less than 80,000 koalas left in the wild, possibly as few as 43,000.” This certainly makes 50 Koalas extremely significant. Personally, I think every Koala is significant, but we are talking about big money to be made here versus the habitat & survival of an animal. This is always a problem because the animals generally lose. That the Koala is listed as vulnerable in NSW is supremely important. 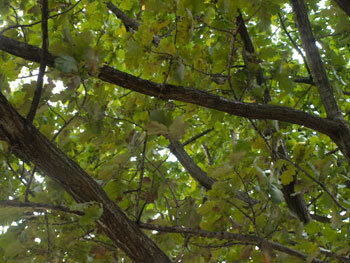 As of last weekend the historic Fig tree at the IKEA development Tempe was still standing. 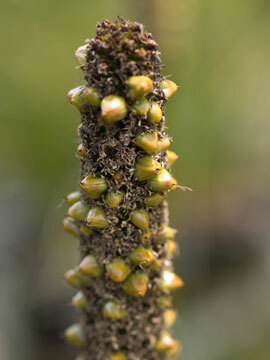 Its shape has changed so I think it has been pruned. In the May 2010 edition of Marrickville Matters magazine, Mayor Iskandar said, “I urge Marrickville residents to find that piece of land that is not being used & come to us for help to establish their own community garden.” Marrickville Councils Community Sustainability Co-ordinator can be contacted on 9335-2222. May’s magazine has a environmental feel with many articles focusing on the environment across the LGA. Council also says Mackey Park in Marrickville South will be carbon-neutral with all power needs being offset by the use of photovoltaic cells which generate electricity when exposed to sunlight. This is really good. It is such as shame as we know they can do better. 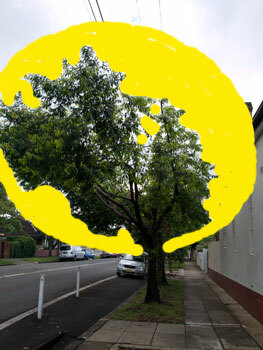 See https://savingourtrees.wordpress.com/2010/02/14/tree-pruning-planting-practices-compare/ where just last February I complimented Energy Australia for the good pruning they did in Excelsior Parade. 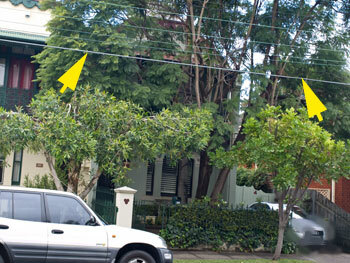 Even Renwick Street has different pruning outcomes. The lower end, towards Carrington Road, the street trees were moderately pruned. 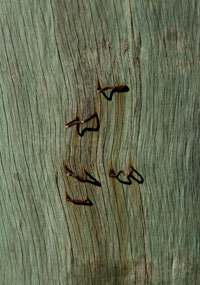 Some trees that had been almost destroyed during the previous pruning cycle 7-8 years ago were looked after this time. Interestingly, Energy Australia workers did not clear branches below the Optus cables at this end of Renwick Street, whereas up the other end the Optus cables where given a huge clearance. The trees on the corner of Renwick & Excelsior had more than 2/3s of their canopy removed. Their website http://www.brisbane.qld.gov.au/BCC:BASE::pc=PC_694 says residents can request a street tree be planted & provides a list of suitable trees. 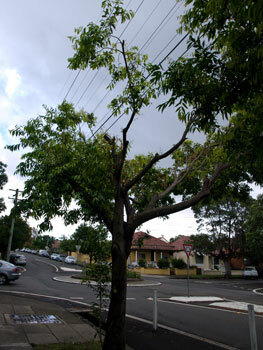 Brisbane City Council also say they plant trees which will not interfere with overhead powerlines & that street trees are classified as “valuable Council & community assets” & protected under the Natural Assets Local Law making it an offence to prune, interfere with or remove street trees. Wonderful. The Boulevard in Dulwich Hill is an excellent local example of a street loved because of its many, large street trees that cascade over the road. Ask any real estate agent & they will tell you this street is sort after with buyers paying more to purchase property here because of the presence of these trees. 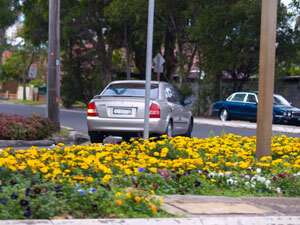 Personally, I would love it if our Council copied the ‘instant boulevard’ idea. Even planting more developed trees would be a step forward as these have a greater chance of surviving. 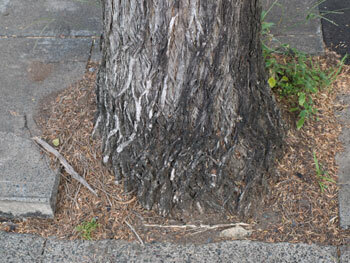 City of Sydney Council planted 200 litre root-ball 4 metre high Simon Poplars along & on the corner of side streets in Glebe Point Road in 2009. All these trees have survived & are growing well. There positive impact was immediate & the area looks greener & prettier for it. Koalas are listed as a threatened species & classified as ‘vulnerable.’ From the NSW state governments own web-site – A ‘vulnerable’ species is likely to become endangered unless the circumstances & factors threatening its survival or evolutionary development cease to operate. Yet, they are taking down forests where Koalas are known to live. I just don’t understand this.